What I love about this recipe is that it’s easy to make and easy on cleanup. This is one of my Friday night staples. Open hoagie buns and spread both insides with butter. Set aside. Heat stovetop to medium-high heat. Combine onions and olive oil in a large, nonstick skillet and sautee for 1-2 minutes. Add green bell peppers and sprinkle with a touch of black pepper. Sautee with onions for 2-4 minutes. Add shredded rotisserie chicken (you can add a drizzle of olive oil here if you’d like, but it’s not necessary. But then, why would you pass up olive oil?) Sprinkle with a touch of black pepper and sea salt and cook until thoroughly heated. Reduce heat to medium-low. Place hoagie roll face down onto heated skillet and cook until inside and edges are brown, about 1 1/2-3 minutes. Remove from heat and set aside. Top meat, onion, and bell pepper mixture with slices of provolone cheese. 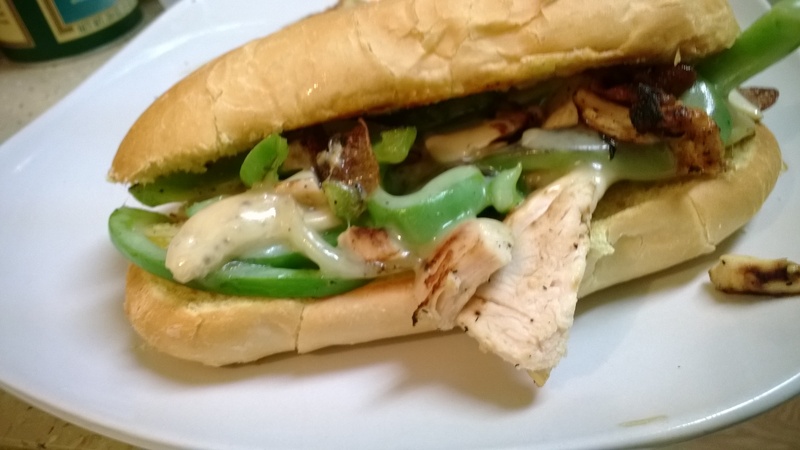 Wait until cheese is melted, then slide the mixture onto hoagie roll. Repeat until all of the chicken, onion, and bell pepper mixture is gone or until arms get tired. Serve with fries or skillet chips. * I’ve cooked this recipe using both rotisserie chicken and shredded chicken breasts. If you want to use the latter, boil chicken breasts and sea salt/black pepper (to taste) over high heat for 15-20 minutes or until tender and cooked through.